After shopping at Target or Lowes, take a break for a specialty pizza, sandwich, craft beer and more at Lynnwood Grill & Brewing Concern. Our brewery located in the Grove Barton Shopping Center is a comfortable, fun environment that’s a great place to visit any day of the week. 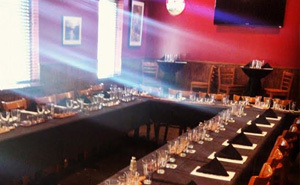 At our Raleigh bar and grill, we make it our priority to bring our customers quality food, drinks and events. We use fresh or organic ingredients in our menu items, and our pizza dough and sauce is made daily. Lynnwood Brewing Concern of Grove Barton Shopping Center is proud to serve a variety of house-brewed craft beers, including ambers, IPAs, belgians, blondes, stouts and more. Our brewmasters have perfected each brew; two of our beers have won national awards, and we know they are plenty more to come! Drink your LBC craft beer while sitting on our rooftop with friends, watching the game or participating in trivia night or any of our other events. Check out our calendar to see what’s happening at our restaurant in Raleigh’s Grove Barton Shopping Center. Next time you’re in the Grove Barton Shopping Center, stop by LBC to take advantage of our weekly specials. We love getting to know the surrounding community, so don’t forget to introduce yourself and visit us again. Contact us at (919) 785-0043 to order food to-go or to hear about our private banquet seating and catering services in Raleigh. 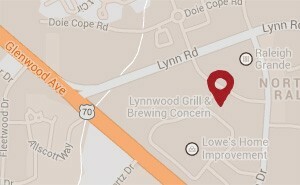 Located in the Grove Barton Shopping Center, Lynnwood Grill & Brewing Concern brings our customers great food, craft beer, trivia night, fun events and more.